$549 Includes Shipping in the USA. 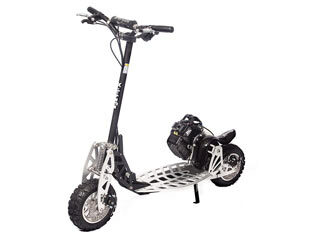 Our ULTIMATE Gas Scooter: Signature Series (A-Blaze) 50cc 2 Stroke XG-575-DS. The XG-575-DS comes standard with a EPA certified gasoline engine and a Puzey Patented 2 Speed Shifter Transmission. This gas scooter can reach speeds up to 40 MPH. The XG-575-DS has racing handlebars with a foam center pad signed by A-Blaze (Signature Series), front and rear vented disk brakes, the widest billet CNC cut deck available, and a Fold-N-Lock system which allows you to quickly fold the handle pole down for easy transportation or to load into the trunk of a car, or back of an suv. *Note: 2 stroke engines require that you mix 2 cycle oil with the gasoline. Instructions and a fuel / oil mixing bottle are provided. Effective 2010: Gasoline scooters cannot be manufactured with a seat kit included unless they are classified as a motor vehicle (motorcycle). Gas scooters of this type cannot be classified as a motorcycle and therefore a seat kit cannot be offered with the (new scooter). We do sell seat kits separately that fit all models call Dave at 478-396-6796 for details.